There are two pollution measurements (fine particulates less than 2.5 µm in diameter, PM 2.5) published in Beijing, one from the US Embassy and one official Chinese measurement. The US measurement has caused quite some controversy, and Chinese authorities claim that its illegal. Still, the US measurement has been trusted by both expats and Chinese for many years, while the Chinese only started publishing their PM 2.5 measurements this January. Just out of curiosity I have systematically sampled the two, and found that even though both report on average unhealthy pollution levels the Chinese measurement is significantly lower than the US, meaning that the Chinese report lower pollution levels or better air quality. When comparing the two it should be noted that the Chinese measurement is apparently somewhere in western Beijing, whereas the US measurement is performed at their embassy in Chaoyang. Method: From April 17th 2012 at 19:00 to May 16th at 22:00 I recorded both US and Chinese measurements every hour. The Chinese measurement is only available for 24 hours, and I missed recording them at 10 instances. There was also 19 instances where there was no US measurement and 5 instances where there was no Chinese measurement. This left me with a sample size of 667 measurement pairs. The US Embassy publishes both PM 2.5 and air quality index (AQI). The AQI is a handy measure for the public to understand the severity of the pollution, but the conversion from PM 2.5 to AQI is nonlinear, hence for statistical analysis one should use the PM 2.5 measurements.The US embassy PM 2.5 measurement is in µg/m3 and the Chinese in mg/m3, and I’ve been converting to µg/m3 throughout. Just for reference I have converted some results to AQI. For statistical analysis I’ve been using a paired t-Test and linear regression. I have not performed any analysis of outliers but included all measurements. Converting these results to AQI, this means that the US measurement is on average 179 and the Chinese is 158, both falling in the AQI category “Unhealthy”. The maximum levels reported by the two corresponds to AQI 362 and 314 respectively. All AQI levels above 300 are considered “Hazardous”. 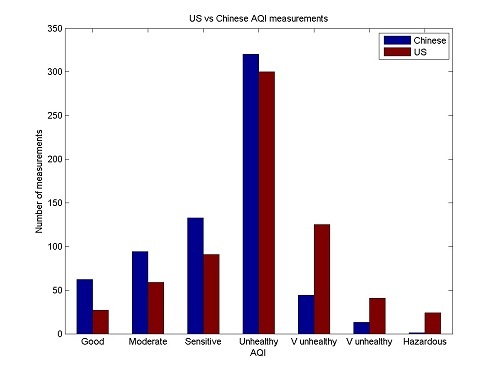 According to the t-test the correlation between the US and Chinese PM 2.5 measurements is suprisingly low, only 0.57, indicating that there is in fact a very poor relationship between the two. By reading one one cannot really guess what the other one might be and one cannot substitute the other. Histogram of US and Chinese AQI measurements in Beijing. These figures are the AQI values, and one can clearly see that the Chinese measurements are skewed towards lower AQI values than the US. ‘Sensitive’ refers to the category ‘Unhealthy for sensitive groups’ and ‘V unhealthy’ is the ‘Very unhealthy groups. 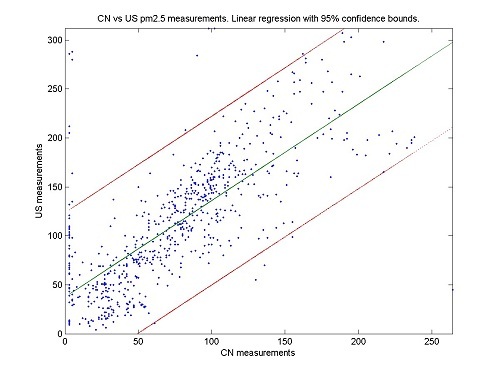 Scatter plot of US and Chinese PM 2.5 measurements (not AQI values) with 95% confidence intervals. This plot can be interpreted as that if the Chinese PM 2.5 measurement is for instance 100 µg/m3, one can be 95% sure that the US measurement will be between approximately 50 and 220 µg/m3. In other words the one is not a good indicator of what the other might be. Please note: I have no knowledge of the technology behind pollution measurements, hence I am not able to make any discussion of the reasons for the discrepancies between the US and Chinese measurements. I am also not able to judge which one is the “better” or more reliable one. It is also important to note that they are located quite far from each other. I have just done this comparison because I thought it was fun, thus I make no scientific claims. I går var forurensningsnivået over det nivået som betegnes som ‘Hazardous’ (farlig) igjen dvs godt over 300. Hodepinen rullet in med full kraft på kvelden. 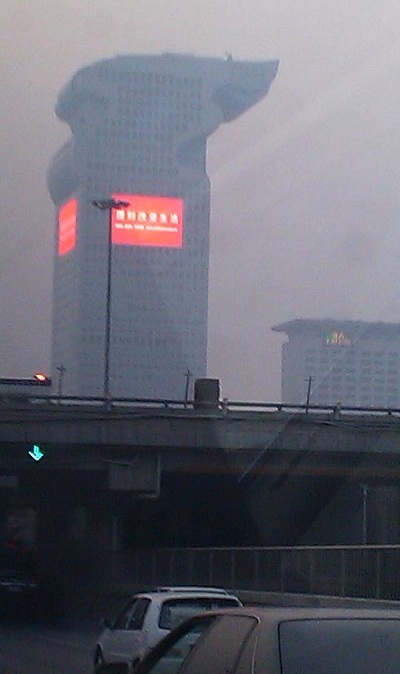 For en tid tilbake moret jeg meg med å fotografere et av landemerkene i Beijing, Pangu Plaza, i ulike grader av forurensning. Det ligger rett ved siden av olympiaparken fra 2008 og de gangene jeg bruker bil til universitetet passerer jeg det. 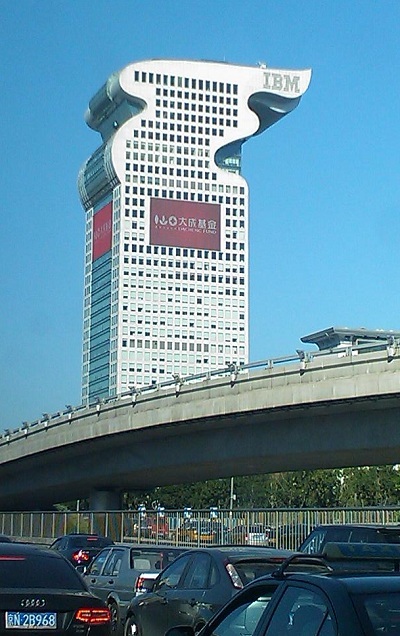 Er luften klar og man kommer litt høyt opp et sted kan man se det karakteristiske huset fra nesten over alt i Beijing. Døm selv! Pangu Plaza fotografert fra fjerde ringvei når luftkvaliteten er ‘moderat’, rundt 50-100. Det er allikevel dårligere enn det luften noensinne blir i Norge eller Sverige. Fotografert 20 september 2011 klokken 8 på morgenen. Samme bygg fotografert fra nesten eksakt samme sted. Her ligger luftforurensningen på rundt 270 (kategorien ‘svært skadelig’). Fotografert 25 september 2011 litt før klokken 18. Nå er nyttårsfeiringen her helt slutt og den grå hverdagen har begynt igjen. Desverre har den vært inmari grå, det er brun tåke her igjen. I klasserommet i dag syntes jeg det var disig innendørs. Forurensningsnivåene som vi følger fra den amerikanske ambassadens målinger som de legger ut på Twitter hver time lå på 499 ved midnatt i går. Skalaen går bare til 500 og alt over 301 har betegnelsen ‘hazardous’, eller rett og slett ‘farlig’. Det hører med til sjeldenhetene at vi er under 100, vi bruker med andre ord vanligvis ligge innen det intervallet som kalles ‘helsefarlig for følsomme personer’. Hele tabellen finnes her. Til sammenligning tror jeg Oslo bruker å ligge på 20-30. Barnehagen holder ungene godt innendørs i renset luft på disse dagene, og jeg får hodepine bare jeg går litt fort når jeg er ute. Det var enda værre en helg i høst, da brøt hele målesystemet på ambassaden sammen. Da var det så ille at tårene rant, nå er det heldigvis ikke riktig der. Nå håper vi på litt vind så den blå himmelen vi hadde så fint forrige uke kommer tilbake. Jeg ser nå at nivåene er nede på 430, så det skal vi vel være glade for. 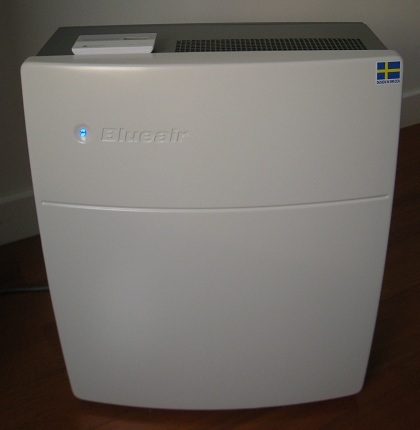 Tydeligvis er det sånn at barna klarer seg bra, bare vi flytter herifra før de er 7 år. De klarer å regenerere lungevevet sitt. Det er bare vi voksne som kommer til å få med oss souvenirer fra Beijing å spare på hele livet.